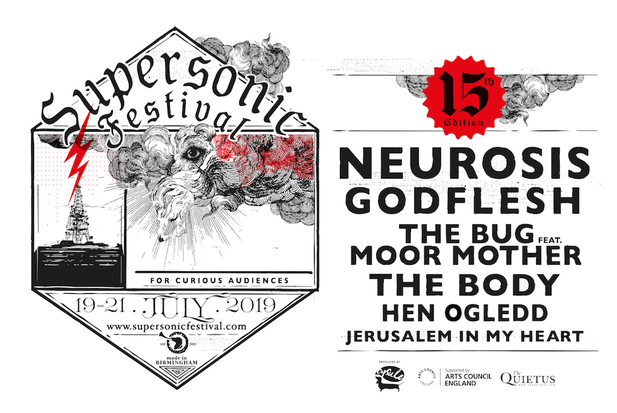 As part of Supersonic Festival‘s 15 year anniversary year, Neurosis shall be headlining in the stunning historic Grade I listed Birmingham Town Hall and we are thrilled to announce that supporting them are Brum legends and pioneers of heavy industrial sound, Godflesh, which promises to be an unforgettable experience. Justin K Broadrick has a longstanding relationship with the Festival, as Supersonic have presented (and premiered) a number of his musical projects over the years. The venue has a firm place in Birmingham’s musical heritage, having played host to the likes of Black Sabbath and Led Zeppelin in the 60’s and 70’s, which ties in nicely with the major Home Of Metal exhibit that shall be taking place in tandem to the festival – celebrating the forefathers of Metal – Black Sabbath. The Town Hall Supersonic event is limited capacity so patrons are encouraged to book now to avoid disappointment. Over in Digbeth and across the 15 year anniversary weekend, Supersonic Festival are pleased to present The Bug Feat. Moor Mother, an innovative, viscerally charged, brand new collaboration. The unstoppable energy of these two powerful musical forces in combination promises to be a thrilling edition to the 2019 line up, and feels especially fitting given that The Bug first appeared in Supersonic’s first ever edition back in 2003. Supersonic Festival are so happy to invite The Body, a band who truly sound like no other. Known for their intense, abrasive live shows, whose waves of dissonance create an abiding dread or an overwhelming sense of terror. They create a volume of sound almost unfathomable from a duo and are unaffected by instrument choice: guitar and drums, or keyboard and synthesizers, we eagerly await to see what the performance in July shall bring. Hen Ogledd shall delight with their phantasmal blend of ravishing melodies, hallucinatory textures and bonkers rhythms at Supersonic Festival’s 15 year edition. Comprising Sally Pilkington’s picture-perfect pop and earthy singing, Rhodri Davies’ blazing harp splutterations and guitar moans, Dawn Bothwell’s twisted telephone techno and bamboozling lyric-bombs and Richard Dawson’s utter bass. The acclaimed Montréal–Beirut contemporary Arabic audio-visual duo Jerusalem In My Heart (JIMH) comprised of musician/producer Radwan Ghazi Moumneh and experimental analog filmmaker Charles-André Coderre shall also grace the stage at Supersonic Festival. Guided by Moumneh’s melding of ‘traditional’ melismatic singing (in Arabic) and buzuk playing, with modern deployments of modular synthesis, filter banks, power electronics, field recordings, etc. JIMH pay homage to the blown-out distortions of historical Arabic cassette tape culture, processed through modern currents of electronic music. Moumneh’s lyrical themes are deeply expressive and rich in political and socio-cultural historical consciousness, all of which are complimented by Charles-André Coderre’s 16mm film loops and projections that are an integral part of the JIMH aesthetic identity.